A&E Report August. North Grampians August working bees announced. It’s a long post but please read through. Info for climbers and boulderers alike. I have been collaborating with David Witham from the Grampians Walking Track Support Group and Tammy Schoo at Parks Victoria on finalizing dates for the North Grampians working bees. Dates have been set for the first of the working bees in the North Grampians climbing areas. Please drop me a line at cliffcare@vicclimb.org.au as soon as possible to register your availability for your preferred date. I will be sending out more details once I have a list of people. We are really hoping for a good turnout for these days. Gives us a much better chance of getting some climbing in the area come the September holidays! Wed 20th August – Tree risk and vegetation clearing works at Stapylton Amphitheatre, Summerday Valley and Andersons. Working with David, our chainsaw guy, this day requires only a couple of extra workers. Thursday 21st August – Stapylton Ampitheatre. Grey/ Green Walls Rehab track works and belay area delineation. Also any required works around the Taipan area. Possible start on some works in the Summerday Valley/Bark Wall area. Enough people for two or more groups would be good. Saturday 23rd August – Bark Wall (Summerday Valley area) rock works. Also other veg clearing, abseil area delineation works. Enough people for two groups would be beneficial. As this is a weekend working bee, there will also be a VCC trip run in conjunction with it. Working bee on the Saturday and climbing on the Sunday (location to be confirmed) So if you are wanting to help out and also find a climbing partner for Sunday this could be a good option. You are also welcome to just be part of the working bee. Some food and beverage will be supplied on these work days and start time will be 9.30am. There is also the possibility of another working day or two in September should we need it. Especially in respect to some of the bouldering areas in the North Gramps. The PV team at Halls Gap would like to get some of the tracks into these areas delineated and are contemplating the idea of some of them being a bit more formalized. The team are really keen to get the bouldering community on board with this so I am aiming to organize a small group to meet either late this week or early next to visit the site and have some discussion on what they think might work for tracks between these areas. I will be contacting some of you that I already know but if you think that you might be available on a weekday to come along and to have a say on bouldering in the Northern Grampians please drop me a line. This will also be an opportunity for discussion on the future of bouldering in the Grampians National Park. This is also something that the team I have been working with at Halls Gap PV are really keen to start dialogue on. With bouldering and new development occurring throughout the park, it is important that we have these discussions to avoid any issues with sensitive areas in the Grampians. Moving forward with a sustainable plan for the future and having the climbing community involved and on board with it means a much more successful outcome for both sides. 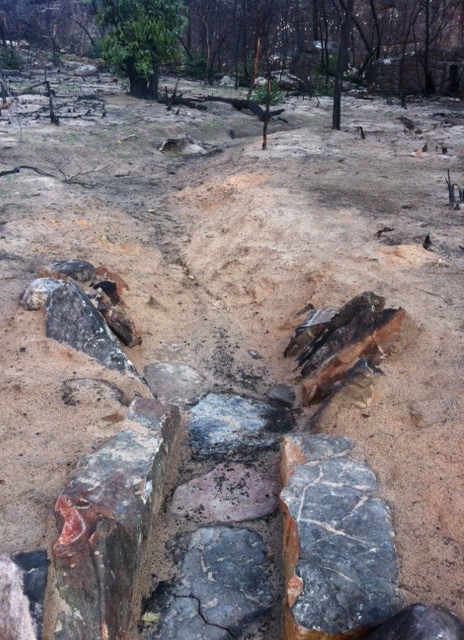 A new rock drain in Summerday Valley. The drain is actually the old walking track which now acts as the main drainage through the site. This entry was posted in Access &Environment officer reports, events, Grampians, Parks Victoria updates & info, Volunteers and tagged access report, Bushfires, cliffcare, closures, fundraising, grampians by Tracey. Bookmark the permalink.